Discussion in 'Kitchen Appliances, Cookware, Cookbooks & Recipes' started by detroitdad, Sep 12, 2018. I picked up some new ones last month and their cheap plastic grinder is already broke. I plan on ordering one from Amazon. I would prefer a metal mechanism. I'm not opposed to any. I would like to keep it in the 30 dollar price range, but will go a little higher if necessary. Thoughts? What do you have? am I over thinking this? lol. The last one is the most expensive pepper mill I've ever seen! I've got salt/pepper mills I bought for about £8 each and have lasted years but they do have plastic grinders. I think the Peugeot has good press and will last. Make sure you get one with ceramic grinding "teeth", not metal. The metal ones eventually rust (presumably from holding it over steamy food) so you end up grinding a little rust into your food. 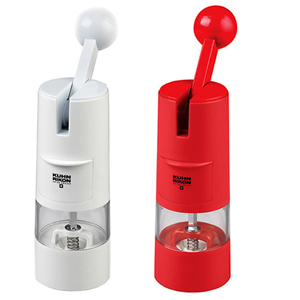 We love our battery powered pepper and salt grinders. They make grinding fun, plus a heck of a lot easier when having to freshly grind 2 tbsps or more for something like a dry rub or marinade. Whenever our guests ask for salt or pepper, they think the powered ones are really cool, although you have to warn them not to over do it because it's fun. I have battery and hand ones. Battery for showing off to friends,lol. I rarely, if ever, use finely ground black pepper so generally use the coffee grinder attachment on the blender. Other than that my wife will pound a few corns in the pok-pok. I just blitz it in the spice grinder. Gave up on buying mills. Although I sometimes prefer it finer that that. That works for cracked black pepper. The spice grinder can do that or a little finer or completely ground. The great thing is that I can get consistent amounts of pepper when I use it: 20 cranks of the handle = 1/4 teaspoon, so I know how much to use. And, when I decide to add rainbow peppercorns, the window makes for an attractive addition to the dinner table.